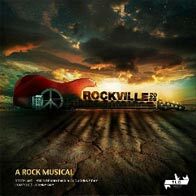 Rockville 2069 began its life with the production of a Graphic Novel and Concept Album. The music for the album was written by Johnny Ray, arranged by Johnny Ray and Kyle Petersen, with lyrics and script by Johnny Ray and Bruno Paiola. The Graphic Novel and CD were launched in 2012 and the album is also available on most online retail stores ,such as iTunes. The concept album started with 22 songs and as the stage version was evolving it soon became 25 songs ,which was released in 2013,and by the time we were ready for the stage adaption it grew to 30 songs. The arrangements for the concept album were adapted for orchestration by Darryl Andrews. The 22-track original soundtrack and a graphic novel has been released on the EMI label for manufacture and distribution. Next Music has released the soundtrack internationally on all online platforms. DALRO have been appointed as the international box office administrators. Understanding that preparation is crucial to create an epic product, Rockville 2069 has been quietly brewing in coffee shops, rehearsal rooms, boardrooms and recording studios for years. The staging is innovative, the music has been taken to new heights in terms of traditional musicals. Technology plays a key role, whilst keeping all the classic advantages of hit musicals.